Specifications: Dimensions: Approx :12.4X4.4X14.8CM / 4.88"X1.73"X5.83" Output Power: 3.76W Speed Mode: Low/Midium/High Battery type: Li-ion 18650 (INCLUDED) Battery voltage: 3.7V Charging type: DC 5V USB & 18650 rechargeable battery Working way: Use AC adapter or rechargeable battery Dimensions: Approx :12.4X4.4X14.8CM Working tiem:2,4,8 (depend on mode) Charging time:5 H Net weight:221g Charging:DC 5V/600MA Operating Instruction: Botton off: power off immediately Button on: power on, press once to change a speed. The speed program is low-medium-high-turn on the side LED light- power off Press the "on" and hold it for 5 seconds can turn on or turn off the inside colorful lights. Charging indicator light: red means charging; green means fully charged. Charging battery through the Micro USB input Package includes: 1 x MiNi Rechargeable Desk Fan Personal Fan 1 x 18650 rechargeable battery 1 x Micro USB Charging Cable 1 x User Manual NOTE: Please Make Sure You Take Off The Battery Insulation Film Before Using. As the different production order, the appearance color of battery may be blue .Except the battery color, other all is the same as the pictures, please rest assured to choose. 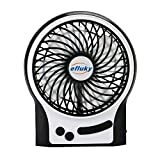 Efluky Mini USB 3 Speeds Rechargeable Portable Table Fan, 4.5-Inch, Black out of 5 based on ratings.